Enterprise Solutions: We offer specialized software development services. Get more information on our enterprise solutions and sub-services. Custom Software Development: We provide specialized software development. Get more information on our software development services and sub-services. Mobile App Development: We offer specialized Software development. Get more information on our mobile app development services. Software Testing: We offer specialized software development services. Get more information on our software testing services and sub-services. Infrastructure Management Service: We offer specialized software development services. Get more information on our IMS services and sub-services. Database Services: We offer specialized software development services. Get more information on our database services and sub-services. IT Staffing: We offer specialized software development services. Get more information on our IT staffing services and staff augmentation services. Industries: We offer specialized software development services. Get more information on our Industries. e-Learning: We offer specialized software development services. Get more information on our e-Learning services and sub-services. Software Development Articles: Our software development services are comprehensive and well-researched. Check out our software development articles. Is Microservice The Next Trending Technology? Why Is Serverless Cloud Computing the Future of Cloud Infrastructure? How Will AI Transform Infrastructure Management? Why Does Your Business Need WebRTC and CloudRTC? HTC Vive vs. Oculus Rift vs. PlayStation VR Headset: Which One Suits You Best? Why Do Software Projects Fail? Are you looking for a structural framework solution for your application that provides exceptional modularity with improved consistency and faster compilation time? If yes, then you should go for AngularJS development as it is one of the best open-source frameworks available in the market today. Its out-of-the-box MVC driven framework can integrate all the elements to build a powerful application. Moreover, the coding requirement is comparatively lesser than other frameworks, and it can run on every platform. Outsource2india, a leading provider of AngularJS development services in India, has 7+ years of experience in developing mobile and web applications using AngularJS framework for global clients. We offer tailor-made AngularJS development solutions with on-time delivery and have a transparent software development process at our organization. In the AngularJS development, HTML is the primary language to create the web/mobile interface. Our AngularJS developers can bring your business ideas into reality by creating robust web or mobile apps. You can leverage our offshore AngularJS development services to create a simple, powerful, and a beautiful portal system. We can also include floating panels in the portals with drag and drop option. Our full-stack developers and designers can create and design cross-platform desktop and mobile application by leveraging HTML5, JAVA, and AngularJS. If you want custom widgets in your web or mobile app, we can design, create and configure custom widgets on your application. One of the best features of AngularJS is that it separates the model from view, which helps in building the plugins. We can design your app framework in a way to support the plugins and also help you build one. Under our AngularJS development services, we provide easy migration of the application code base to the AngularJS platform. Our developers can also assist you to integrate and deploy the code in the AngularJS framework. We have a gamut of AngularJS developers, designers, and consultants. When you decide on outsourcing AngularJS development to us, our consultants will help you with framework design, Angular directives creation, and troubleshoot any problems, if that happens. We can help you develop eCommerce websites with AngularJS. Our developers can target the dynamic views in an eCommerce app to make it light and easy to use. If you feel that the front end of your eCommerce website should be remodeled or require custom features, then you should definitely collaborate with us. AngularJS is renowned for its rock-solid client-side development technology that can be used to create a highly scalable shopping cart solution. Our team of highly trained AngularJS developers can build a host-customized shopping cart and can integrate the back end as well. We have a flexible pricing model for all our services based on factors such as the number of resources, location, the scale of the project, shift coverage, etc. With us, you can save the cost of application development and boost our ROI. Outsource2india has achieved ISO 27001: 2013 certification, which reflects our commitment to safeguarding your data against any security mishap. We also make sure that all our resources comply with the ISMS guidelines at all times. All our software development process complies with the 9001:2015 quality management standards. Our multi-level quality assurance process ensures that your AngularJS application is robust, high-performing, and secure. Our AngularJS developers, programmers, testers and designers have access to sophisticated tools, systems, and technologies, which help deliver your application within the stipulated time. Moreover, our workstations and delivery centers have 200% power back up, inbuilt IT redundancies, uninterrupted network supplies, Telco-grade data center, etc. We have more than 7 years of experience in providing AngularJS development services. Our management team's experience surpasses 100+ man-years. We have more than 50 software developers, designers, and testers. Thus, with us, you are guaranteed highly professional AngularJS development services. The burden of clinicians to manually enter the data will reduce. The EHRs in 2020 will give equal importance to patient's and clinician's entered information. The clinical staff will be able to create customized reports, which will ease learning and research for the EHR system. We constantly follow-up with our clients to gather their feedback or find out any gaps. Moreover, we have several active members in the AngularJS community who actively participate and contribute there. 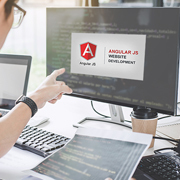 They continually hone their skills by keeping themselves updated with the latest developments, design features, and plugins in the AngularJS domain. Our contact center executives are available 24/7 and you can raise any queries across all the time zones. You can communicate with them via phone, email, or chat at your convenient time. We give a lot of importance to the quick turnarounds and have adopted the Six-Sigma methodology to boost our team's performance and minimize the waste. Our application development process is designed in a way to expedite its delivery so that you get the complete application within the agreed time. When you outsource AngularJS development services to us, you will get a dedicated project manager who will be your first point of contact and also keep you updated on the project development. At O2I, we have the capability of the required resources, both in terms of technical expertise and infrastructure. If you want to expedite the delivery time or need to spike the services, we can do that for you. This way you do not have to invest in hiring new resources or build infrastructure. Outsource2india is a pioneer provider of AngularJS development services in India with 7+ years of experience in developing web and mobile applications using the AngularJS framework for global clients. We have a team of experienced web developers who are proficient in developing innovative applications using AngularJS. Moreover, we have a transparent software development process at our facility and offer tailor-made solutions with on-time delivery and 24/7 support & maintenance services. Outsource AngularJS development services to us to avail reliable, cost-effective, and timely solutions for your AngularJS development requirements. Get in touch with us today! Our software development services have created global success stories.